Discover our high-quality Challenger biros of the German Senator brand, which not only write up a storm but, when professionally pad printed by us with your name or logo etc., are an extremely effective giveaway. 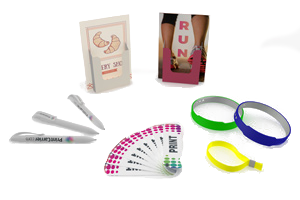 Ballpoint pens are among the most popular giveaways – customers of all colours are delighted to accept them. Best of all, your clients, business partners etc. are constantly reminded of you while they are writing, signing or sketching, in the office, on the road or at home. In other words, you can count on ballpoint pens printed with your logo, web address or slogan to inscribe good memories of you. Like with our inks and papers, we also ensure branded German quality in our ballpoint pens. Namely by ordering all of them from Europe’s leading manufacturer, Senator based in Gross-Bieberau near Darmstadt. Put yourself in view again and again with a personalised imprint. We can put it on the clip, the grip or both, as you choose. Either using a design submitted by you or based on our advice. In any case, our goal is to optimally position your advertising. For us, precision starts with the details. We therefore print your ballpoint pens using state-of-the-art pad printing. This results in brilliant colours and ultra-sharp detail on a very small scale: in the case of the clip, 3.5 x 0.6cm or with the pen shaft on just 5 x 0.6 cm. Everyone has a different favourite colour. We therefore try to please everyone with our palette. The bodies of our ballpoint pens are available in 11 different hues: dark-blue, yellow, green, light-blue, magenta, mint, orange, red, black, violet and white. 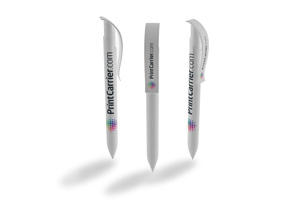 We are even more flexible when it comes to printing on your pens. Whether you prefer elegant silver or timeless gold, sunny yellow or juicy green, we can add text and/or pictures to your ballpoint pens in any colour you like. For instance, one that ideally harmonises with your corporate design. We print and deliver your ballpoint pens to any address you wish within eight to nine working days of receiving your order, in a quantity of 100, 200, 500, 1000, 2000, 5000 or 10,000. Then you’ll always have an appropriate giveaway at hand for every occasion. 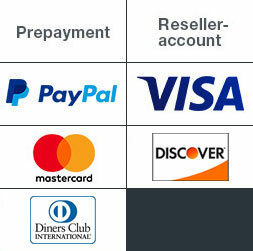 Without letting the shipping costs exceed your budget, because with us they are always included in the price. At least, that’s what our long-customer customers tell us. They know that we value their satisfaction more than anything else, and that we even give a full refund to new clients if anything should go wrong. Or make it up to returning customers with generous solutions if they think our quality is less than 100%.